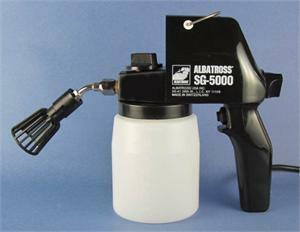 The Albatross SG-5000 is the most powerful spot cleaning gun manufactured. It is perfect for high volume screen printers, textile mills, apparel manufacturer and other applications where heavy duty use is required. Features include: Extremely High Pressure Unbreakable - High Impact Plastic Housing Vapor Lock Switch Variable Spray Nozzle 60 Watt Motor Draws from Large 22 oz. Jar or Directly from Bulk Containers Brass and Stainless Steel Pump Assembly for Years of Trouble Free Use. Made in Switzerland for Precision Quality.